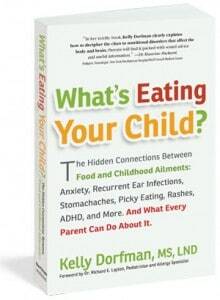 Author: Kelly Dorfman, M.S, L.N.D. As the mother of a severely asthmatic four year old who also has eczema rashes, I was very interested in reading this book. I found the case studies presented by the author to be interesting in the detailed information that she presented such as “The Case of the boy who wouldn’t grow” and “The Little Colon who couldn’t”. I understand firsthand how frustrating it can be for parents when you have a symptomatic child so I appreciate that there are simple yet effective solutions that can make a dramatic difference. One particular subject of interest in the book is in regards to the importance of zinc. I can personally attest to zinc helping my daughter’s asthma and eczema significantly when this was recommended by her specialist three years ago. The author is a nutritionist whose goal is to empower parents to use methods such as the E.A.T. program and offer suggestions for getting children off of drugs like antibiotics, laxatives, Prozac and Ritalin. I learned a lot from reading this book and highly recommend it for any parents who are also struggling with related childhood ailments.